Ukrainian President Petro Poroshenko has called on Ukraine's democratic forces to unite into a coalition before the elections to the Verkhovna Rada. "It is desirable that they win, uniting before the elections, as a single political bloc, the Bloc of Petro Poroshenko and all democratic forces. 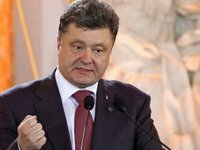 If someone doesn't like such a format of our electoral model, then we need to sign a declaration now to unite into a coalition after winning the parliamentary elections," he said in Kyiv on Wednesday at a congress of the Solidarity Party, during which the party was renamed the Bloc of Petro Poroshenko. The head of state said that it was unacceptable if, after the elections, in addition to the front of the struggle for Ukraine's independence, there is a "second front" that acts against Ukraine. He said that the composition of the new parliament's majority must be known before the elections. "We need to stop the practice of unfair agreements ... We must not repeat the mistakes of the leaders of the national liberation movements of the early twentieth century," Poroshenko said.